Last week I wrote a blog post about the Supreme Court's deliberations regarding marriage equality. The point of the piece was to highlight that the term "biblical marriage" is largely used by conservative and right-wing Christians and politicians as if it were equivalent to the form of monogamous, heterosexual, companionate marriage that conservatives venerate. It's not. Now, don't get me wrong -- I have personally been in one of those of monogamous, heterosexual, companionate marriages for over twenty years and it suits me just fine. But, my marriage in no way resembles the form or ideal of marriage as practiced and represented in the Bible. That was really the point of the post. We live neither in the Ancient Near East or the Greco-Roman world out of which the Hebrew Bible and New Testament arose. There are many, many aspects of daily life and even the practice of our faith that have changed over time. This is what it means to be part of a living faith tradition -- to live into the lives that God has given to us and prayerfully and faithfully discern how God is calling us to live into our future. 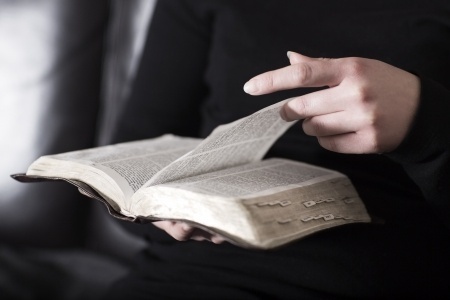 There are three primary ways in which people read and interpret the Bible. While some people may integrate aspects of the second and third approaches, the Biblical literalists usually reject the idea that they are engaging in interpretation. I don't expect this will convince them otherwise, but it does help explain the vicious anger and internecine attacks of Biblical literalists on Christians who read the Bible in a different way. Biblical Literalists - These folks believe that the Bible is the pure and true revelation of God to humanity. As such it represents God's revelation for how we are supposed to live our lives, worship God and prepare for the life to come. Biblical literalists believe that we can turn to the Bible for the answers in how to determine appropriate ethical behavior in our society. They believe that the words of the Bible are to be read literally and enforced. Most biblical literalists are also fundamentalists of some sort or another and they also believe that their faith is not only the way they should live their own lives, but that the correctness of their beliefs provides them with a moral imperative to impose their morality on others - both through moral suasion and through the legislative process. Interpretive Method - People who use this method of reading the Bible recognize that there is no "objective" way to the read the Biblical text that does not, to some extent, impose our own cultural biases, experiences and attitudes into that reading. This approach draws on one of the oldest methods of Biblical interpretation dating back to the ancient Jewish practice of "midrash." Ancient Jewish scholars who recognized that many of the Biblical stories were incomplete and that some of them actually contradicted each other used the technique of midrash to explain, theologize, hypothesize and tell stories about the stories. Contemporary Christians who use this method recognize that every person, in every culture, and in every time who has ever read the stories has "interpreted" them in some way or the other even if they were not aware of it. This becomes even more true in an age and society that primarily relies on translations of the Bible. Historical-Critical Approach - People who use this approach are interested in trying to discern first what the meaning of a particular text or story was in its own day and time. That means that attention is paid to the original language and different possible meanings for words than we might understand today. Attention is paid to other historical documents of the period that might help us understand the cultures surrounding the Israelite people and that consequently might help us understand the Bible itself better. There is an attention to trying to understand reasons behind prohibitions in the Bible in an attempt to discern whether or not these are still valid prohibitions in modern times. I approach the Bible as both a historical document and a witness to my faith and my tradition. There is much for me to learn from its sacred wisdom but it is also a living manifestation of God's presence with us in a faith-filled community. Part of our responsibility, as people of faith, is to discern the deep theological insights that can help us to live faithfully in our world today. The stories of marriage and sexual relationships relayed in the Bible reflect the sexual, social, and moral values of the people who lived in the Ancient Near East, many thousands of years ago. The feminist, egalitarian partnership that I share with my husband is a reflection of the sexual, social, and moral values of the 20th century. Changing our understanding of marriage to incorporate monogamous gay and lesbian companionate marriages will move us in to the 21st century. *Rebecca Todd Peters blogs on issues of Christianity and social justice on her blog To Do Justice.